Have you had the opportunity to check out Kijiji yet? Owned by eBay, it’s their “new & improved” version of Craigslist. You didn’t think the world would let them continue without much competition for too long, did you? Kijiji is named after the Swahili word for “village”, which eBay probably gave some guy a million dollars toÂ come up with. So far,Â Kijiji offers freeÂ classified adsÂ for individualsÂ categorized inÂ 220Â different cities around the United States as well as some Canadian listings. Like Craigslist, KijijiÂ offers free classified ads for individuals to conduct business amongst themselves- without the middleman. TheÂ humorous part of all this is that eBay actually owns 25% of Craigslist; soÂ in essence, they are competing against themselvesÂ in efforts to dominate the Internet’s free classified ads websites. ebay will most likely be using content or listings, etc from craigslist to help build out or “fill in” for kijiji. What a messed up domain they choose. They think its easy? I can’t remember it because theres too many dotted items in a row and I’m really not sure whats going on with it. So far from what I can tell it is is just as normal ebay listings but now listed as an classified instead without the buy now button. We shall see! I thought that it was a very difficult name to get used to as well. You’ve got to look at it twice in order to see how to spell it. What a ridiculous name! 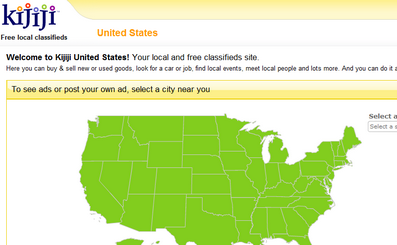 Also I am guessing there must be plenty of other free classifieds competitors in the US? Both kijijijij and craigslist will end up at the bottom of the bottomless internet pit. Enwikopedia – win a darth vader usb flash drive! I’ve now chosen smaller and local sites like ( http://www.vehixcars.info ) nice little site and they even answer your auto questions, and right the first time > I think with proper management this free site could rival these monsters. That’s really the only way someone could give you information on where to start. If you have never done anything like that then you need to start with the basics . . HTML and CSS . . if you have, then it would help to specify what you know.